This video uses satellite images to show how the Hawaiian Tropical Storm Flossie was artificially enhanced using chem bombs. These aerial aerosol explosions are the new evolution of chemtrails used by geo-engineers to manipulate the weather, create storms, create drought and control our weather. It is easy to see these aerosol explosions on infrared weather satellite images once you understand what you are seeing. Chemtrails are now old school. Chembombs are the latest evolution of geoengineering. These are Aerial Aerosol Explosions shot into the stratosphere from ships and from land creating massive artificial chem clouds. This video shows the evidence from infrared satellite images and Google Earth of chem bombs aerosol explosions worldwide. People are seeing fewer chemtrail lines in the sky, but more chem clouds. This is the reason why. ….Chembomb explosions are done away from population centers and then drift over cities. They are not as obvious as traditional chemtrails, but are easily detected on infrared satellite images and even on Google Earth’s weather layer. The nano size particles of aluminum, barium and strontium in the geoengineering aerosols are highly reflective and therefore dominate the infrared satellite images. then choose your region and select the funktop flash loop. (You need to have Adobe Flash, free) This shows a real time, color enhanced infrared loop of the selected region over the past 6-8 hours. The chem bombs are bright red. As they disburse, they change to blue then yellow the bright white. In the sky these artificial chem clouds look like stringy, gooey, cotton candy like un-natural clouds high up in the stratosphere, above the normal cloud layers. These artificial stratospheric clouds follow jet stream flows and usually move in a different direction then the lower natural tropospheric clouds. …You can also view chem clouds on Google Earth. Just download Google Earth (free) and click the weather layer box on the left. You will see a real time infrared satellite images overlaid on Google Earth. Again the highly reflective metals in these man-made aerosol clouds dominate the image and show as bright white. The natural clouds are not reflective and show as light gray. Notice the round explosions of bright white clouds mostly over the ocean. These are the chem bombs creating massive worldwide chem clouds. ….This video is of a presentation by Maui resident Bruce Douglas at the 2012 Consciousness Beyond Chemtrails Conference in Los Angeles on August 17-19, 2012. 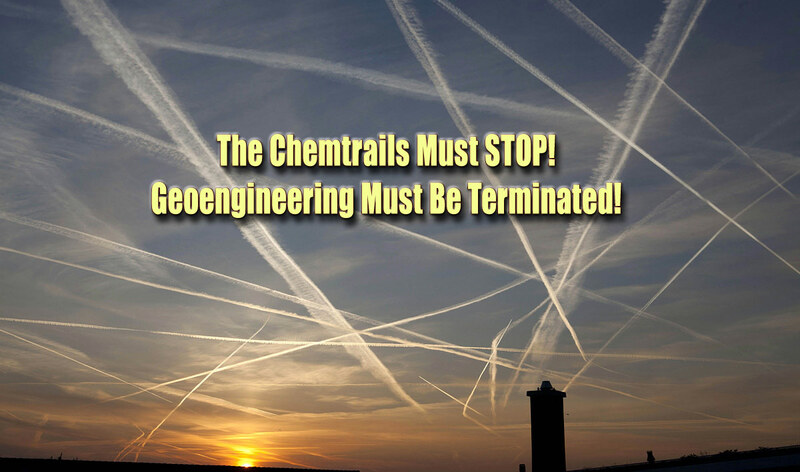 Over 20 presenters share their information about chemtrails, geoengineering and related subjects. Buy the DVD of the entire event. Go to:http://www.ConsciousnessBeyondChemtra… for details. ← What In The World Are They Spraying?